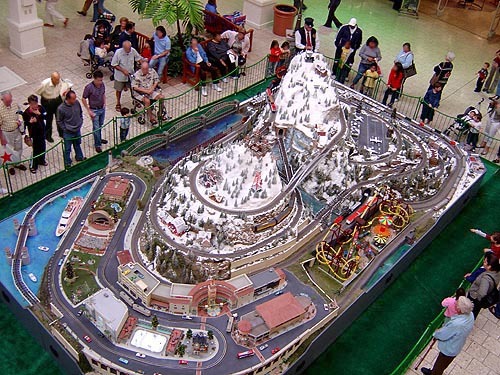 Corporate Model Railroad Layouts – SMARTT: Scale Models, Arts, & Technologies, inc.
- draw and entertain the visiting public to help drive floor traffic. Contract with SMARTT, and you will find that we will work only one way - the right way. Whatever your needs . . . SMARTT can fill the bill. We are your turn-key solution to creating a unique attraction! SMARTT is your Turn-Key solution to creating a custom designed and built Model Railroad display. Simply put, we do it all! Our full service offerings make the process easy and painless. You can be as involved or as un-involved as you wish - the choice is yours. We take you from conceptual design, through planning and engineering, to complete fabrication, installation, and training. Just give us your basic thoughts as to your needs and desires. Whether it's a miniature Christmas winter wonderland, a replica of your local neighborhood, or breath taking scenery to showcase the trains - the designers, fabricators, and artisans at SMARTT will create a unique environment for your Model Railroad layout. Our computer designed modular system delivers absolute precision in fit and finish. This same discipline applies to all the mechanical and electrical aspects of your project. The result --- Reliability second to none. Our art and model departments will create a super realistic miniature world, or a fantasy land of your dreams. The limit is your imagination. Better yet, SMARTT's thorough testing and training programs guarantee bulletproof performance. Only simple maintenance, easily managed by your in-house staff, means the public will always enjoy reliable, daily operation of your attraction. Best of all, working with SMARTT is a worry free experience. Once your project is complete, we handle all the transport and installation set up at your location – your layout is usually ready within days - often just hours. Most important, we achieve it all ON TIME . . . and . . .ON BUDGET!